Caught in a game of power. Playing time: 24 hours. Prizes: Untold wealth. Rules: None. Filled with actors from other disaster movies and packed with clichés that producer Irwin Allen himself originated, When Time Ran Out (1980) was a fitting title for the film that proved to be the last hurrah of the 70’s disaster genre and the final theatrical film for Allen. What it’s all about: As his private jet arrives at his newly opened tropical resort, William Holden presents Jacqueline Bisset with a diamond engagement ring. It’s obvious that Holden has been round the block more than a few times. “What would I be now,” she asks him, “Sixth… seventh?” It seems her heart is set on working man Paul Newman who has his hands full drilling the islands rich oil fields. Though May/December onscreen romances are nothing new, it’s unsettling that Bisset must choose between two such, shall we say… mature suitors. Holden is twenty-six years her senior and Newman nearly twenty. Various subplots are introduced as guests arrive at the luxury hotel. Burgess Meredith and Valentina Cortese play the prerequisite elderly couple. They’re retired high-wire performers and she continually pops pills for her ailing health. Ernest Borgnine is an NYC police detective on the trail of white collar criminal Red Buttons who may or may not be guilty. Every disaster movie needs a smarmy scapegoat, the one guy who could prevent (but doesn’t) all the death and disaster to come. 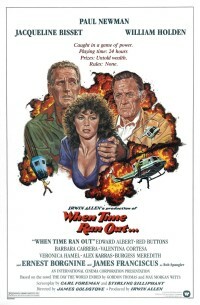 When Time Ran Out has lying businessman James Franciscus. He’s married to beautiful socialite Veronica Hamel but is having an affair with island beauty Barbara Carrera. She’s been “promised to” native boy Edward Albert. Since Carrera had mainly played “exotic” types up to that point, it’s easy to see her (to a certain extent) as a Pacific Islander. Believing blue-eyed Albert as a South Seas native is a bit of a stretch. Newman is concerned with some unusually high pressure readings, so he and Franciscus visit the scientific observation center, a monitoring facility that has literally been built on the rim of the island’s active volcano. In an Irwin Allen movie, science fact often becomes science fiction. Hence, everyone hops into the zany glass bottomed viewing chamber, a pod that can be lowered into the crater so its occupants can get an up close peek at the volcano! Franciscus, twitchy and desperate to gloss over the severity of their eminent doom, clashes with Holden over the possibility of a volcanic eruption. With everything that he’s built threatened by Mother Nature’s cruel fate, Franciscus (who has obvious daddy issues) throws a lava rock paperweight at a creepy portrait of his deceased father. “Come on over here,” he commands. As they lean in for a big smooch the earth moves… literally. Their ridiculous dialog is interrupted by the volcano which begins to rumble right on cue. They hop into their helicopter and watch as the observation platform is destroyed by the volcanic eruption. Oddly inserted into the mayhem are scenes of an airport tarmac buckling and a sports car careening over a hillside. Since none of the main characters are at the airport and we don’t know who’s inside the car, these images are hilariously superfluous. Newman and Bisset airlift Hamel from her horse ranch, saving her from the oncoming flow of lava stock footage. Two ranch hands are forced to brave the helicopter ride by hanging on outside, riding on the struts. Not surprisingly, one of them loses his grip and falls to a fiery death. Except the volcano?! Frankly, if they’re that stupid then they deserve to die. “The lava is coming directly for the hotel.” Bisset warns. Panic ensues and several stunt extras die trying to escape in the helicopter. A fishing village on the other side of the island is rocked by tremors. The camera shakes as pieces of buildings fall and extras scurry around the Hollywood set. It’s all so wonderfully false and rehearsed that you expect a back lot tram tour to pass by. The town and its inhabitants are eventually engulfed by a gigantic tidal wave. The only people who manage to escape are bar owners Pat Morita, his corpulent wife Sheila Allen and two of their “working” girls. The entire cast watches as the matte painting mountain spews forth giant fireballs that explode on hotel grounds. An ignited Borgnine is saved by the quick thinking of Red Buttons. Newman is determined to lead everyone to safer/higher ground but Franciscus, with his tremendous ego and hubris, insists that they all stay where they are. So, Newman punches him. After some pre-trip melodrama, most of the films stars leave the hotel in a caravan. They drive and drive and drive. The endless footage of traveling down tropical roadways is exacerbated by the plodding orchestral march that accompanies it. As they journey onward, we’re treated to the thrilling sight of characters drinking apple juice! Burgess Meredith also mentions for the thousandth time that he’s a retired circus performer. Their first obstacle comes in the form of a blocked roadway. They must continue on foot. A frail Cortese welcomes the challenge of shimmying along a narrow ledge which is all that is left of the collapsed jungle road. “It wasn’t long ago I was walking a high wire.” We know, we know! Everyone shuffles along the matte painting edge. Borgnine, whose face and hands are bandaged, stumbles along with Buttons leading the way. The second ranch hand, who cheated death by surviving the earlier helicopter ride, isn’t so lucky now. He slips and falls to his death, leaving behind his adorable children. Night comes and despite all the chaos around him, Franciscus can’t keep his hands off Carrera. When Hamel walks in on them, she realizes that standing by her man may not have been the best idea. The next challenge for our intrepid band of movie stars is to cross a rickety bridge over a river of hot lava. With plastic jungle foliage and forced perspective mountains built into the island backdrop, this outdoor obstacle course is an obvious soundstage set. After Newman checks the stability of the bridge, Borgnine, Buttons and Albert are the first to cross. For some reason, the lava they’re traversing continually explodes. A plank gives way and they almost fall as fireballs erupt around them. They eventually make it safely to the other side. Holden escorts Mathews and they make it across as well. Despite making it this far together, the adorable geriatric couple must say their final goodbyes to one another. As her heart gives out, Cortese insists that her beloved return to the circus. Bisset, Morita and the two girls are next, but the railing collapses and Morita does a hilarious slow-motion tumble into the lava. A fiery explosion then destroys most of the bridge. All that is left is a narrow trestle. “Years ago in the circus I used to do something special, I walked a high wire,” Meredith tells Newman, “I carried somebody on my back.” Gee, what a convenient skill to have. With a giant bamboo stick for balance and a little kid holding on tight, Meredith makes the treacherous crossing. As Newman makes his way across what is left of the bridge, an explosion leaves him holding on for dear life. As he and the little girl dangle over the fiery river, Meredith comes to their rescue. Our rag-tag group of survivors watch the volcanic pyrotechnics from the safety of an island cave. It’s difficult to say just how close the hotel was built to the bubbling volcano. Depending on the effects shot, it could be miles away from, or right next to, eminent disaster. Inconsistencies aside, a final massive fireball hurtles towards the resort. The destruction of the hotel and deaths of several main characters should’ve been the spectacular finale to this disaster melodrama. Instead, it’s over in mere moments with sloppy fire footage substituting for anything truly remarkable. At daybreak, Newman and the rest of the survivors make their way to the cove where two rescue boats await them. In conclusion: Deleted scenes and additional footage found their way back into the movie when Earth’s Final Fury (the film’s TV title) made its debut on network television. This extended 143 min version was released on VHS as the “expanded video edition” with some of the additional scenes retaining their tell-tale “fade to black” commercial edits. Among other things, the love triangle between Franciscus, Carrera and Albert received more screen time. Before the caravan leaves the hotel, Albert not only learns that Carrera has been unfaithful, but that Franciscus is his half brother! This revelation helps explain why Albert was cast as a Pacific Islander. Without these scenes his part isn’t much more than an extended cameo role. Scenes featuring Alex Karras and a cockfight at Mona’s bar/whorehouse were added as well as a moment where Pat Morita gets to smack a hysterical Sheila Allen. Knowing that Allen is the producer’s wife only makes the slap more enjoyable. The theatrical version of When Time Ran Out runs at a comfortable two hours. The cuts that were made help sharpen the pace and don’t interfere with the story too much. The cockfighting subplot is nearly gone and the painfully long caravan sequence has thankfully been trimmed to a more agreeable length. Unfortunately, Cortese’s death scene near the end of the movie was also trimmed out. Her character dies off camera. The theatrical version also includes some scenes that didn’t make it to the longer video edition. The introduction to the Franciscus and Hamel characters is longer. Their scene in the hotel suite ends with a sensual shower-time tryst. A scene where a winded Borgnine chases after a jogging Red Buttons is included. It’s a comical moment that draws attention to the fact that the two played similar characters years earlier in The Poseidon Adventure (1972). The precarious ledge sequence also is slightly longer. The body of the dead ranch hand is shown at the bottom of the ravine and reaction shots from each of the main characters are shown. A few shots of them hiking through picturesque island wilderness before nightfall are also included. An occasional disaster movie makes it to the big screen nowadays (Into the Storm in 2014, San Andreas in 2015) but, for the most part, the genre has been relegated to the CGI enhanced world of lackluster TV movies. When Time Ran Out should be cherished and appreciated because it truly was the last of its kind. A wild and crazy all-star fight for survival amid marginal special effects. For lovers of cool cinema trash it’s a pity…because they simply don’t make them like this anymore.